Flooding: Why is the taxpayer picking up the tab? There’s an EU fund! 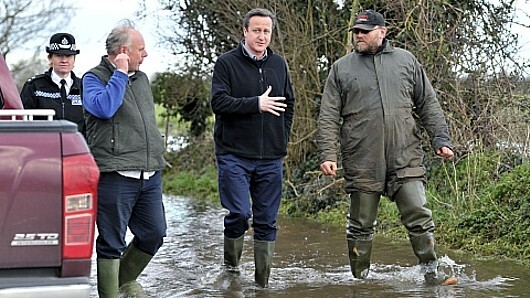 The Conservative response: David Cameron swans around the Somerset Levels in his wellies while local MP Ian Liddell-Grainger (second from left) tries to get a word in edgeways. It seems that David ‘Money Is No Object’ Cameron is unnecessarily forcing British taxpayers to fork out for flood relief while European officials scratch their heads and wonder why he isn’t taking advantage of a huge EU fund that is available to us. We should all know why the comedy Prime Minister is avoiding Europe – he doesn’t want to lose face. Eurosceptics in the Conservative Party across the UK criticise our membership because we pay so much in and take so little out (in their perception); this argument would be defeated if Cameron actually used the fund in the manner for which it was created and he would then lose support from members of his Parliamentary party. Also, at a time when the UK’s future in Europe is being questioned, it would be “politically sensitive” (as Reuters describes it) for Cameron to go there and ask for a handout. 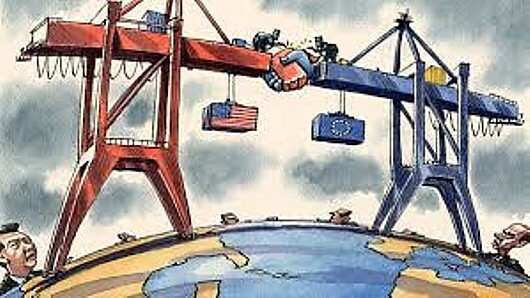 But governments are judged on the way they deal with crises (as the Political Rant blog put it) – and this one has put Cameron, figuratively as well as literally, between the rock and the river. According to Reuters: “Asked whether Britain would ask for EU money, Cameron’s official spokesman told reporters on Wednesday the government was looking at every source of possible funding, playing down the idea that there was anything political behind it. “Under EU rules, a country has 10 weeks from the first damage caused by a natural disaster to request aid. The news agency added that the government had deployed the armed forces to evacuate residents and shore up river defences, while under fire from critics for what ministers have acknowledged was a slow initial response. Political Rant is less diplomatic (as you might expect): “Ken Clarke said it was just a normal winter and people complaining about flood defences were just a ‘lynch mob’. Eric Pickles criticised the Environment Agency while the Environment Agency criticised government cuts and Owen Paterson criticised Eric Pickles. “David Cameron has undertaken several jaunts in his nice clean wellies, first to Kent just after Christmas where he was harangued by people left waist-deep in water without power for a week, then Somerset which he only visited after Prince Charles had been the day before, making it look rather silly the Prime Minister hadn’t bothered, and … to Cornwall where, a friend tells me, Railtrack diverted engineers who were supposed to be fixing the washed-out rail line at Dawlish to shake hands with the PM at a rail depot. “The same PM has talked sadly about how a power cut interrupted his viewing of The Sound of Music on New Year’s Day while staying silent about two SSE engineers who said they were diverted from reinstating the power for 11,000 people to locate his trip switch. Yes, and they’ll be in rural areas because the increased funds Cameron has announced amount only to a slightly smaller cut than he had originally intended, and the funding formula for flood defences demands £8 of economic benefit for every £1 spent – meaning a concentration on densely-populated urban areas. Add to that the fact that Cameron only bothered to act when Conservative-voting areas were affected – the Somerset Levels, Windsor, Reading, Oxdfordshire, Surrey, Kent – and couldn’t care less when the waters were hitting places like Scunthorpe (as revealed on the BBC’s Question Time yesterday) and Cameron has put himself in a serious political mire. He has made it clear that his is a government that only looks after its own supporters. Vox Political deplores the lack of political response to the flooding. But the site will itself go under without YOUR help. Feeling tired? Don’t worry, Vince Van Winkle, we’ve got a cosy place in the Cabinet for you, next to Ken ‘Can’t Keep My Eyes Open’ Clarke! We now know that the correct three-word slogan would have been: “Omnishambles, omnishambles, omnishambles”! Here’s three examples of Coalition government ineptitude that have fallen onto my desk during this morning alone. 1. The government is having to shred £350,000 worth of ballot papers for the Welsh police and crime commissioner elections after a late decision to print them in both English and Welsh. There really is no excuse for this. I know for a fact that Labour and, I believe, Plaid Cymru were both pushing for bilingual ballots, months before now. When Christine Gwyther heard the Home Office did not have Parliamentary approval for bi-lingual ballot papers and information to voters, she immediately took steps to rectify the matter, writing to Bryn Parry-Jones, the returning officer, who agreed to pursue it on an all-Wales basis. She told Labour’s Brecon and Radnorshire constituency party the story at its meeting in September, which was one and a half months ago at the time of writing. The government says the cost will be met from the £75 million election budget. I find this unconscionable. People across the country are getting into terrible states of anxiety over how to afford an extra £20 or £30 a month due to benefit cuts (of which more in a moment), but this government is prepared to throw away hundreds of thousands of pounds because its members couldn’t be bothered to make a perfectly simple decision in a reasonable amount of time. 2. A senior Downing Street aide has quit working for David Cameron in order to join Wonga.com, the loan company that charges bizarrely exorbitant rates of interest – more than 4,000 per cent. This is according to Sky News. Jonathan Luff has done this, allegedly, at a time when the Office of Fair Trading is trying to crack down on payday lenders and concern is high about the industry’s business practices. The question is whether the move will give Wonga inappropriate access to ministerial decision-makers. I guess we’ll find out, if the issue mysteriously goes away in the immediate future, with no explanation. Already, critics have denounced the move as a sign of what Conservative supporters are really interested in – not the good of the country, but the size of their bank accounts. 3. Finally, in an article on this very blog, I seem to have revealed ambiguities in the plan for the new, so-called “bedroom tax” that could add tens, if not hundreds of pounds to the cost for people renting council- or social houses. It seems that it is unclear whether the amounts to be removed from housing benefit – 14 per cent for one extra bedroom, 25 per cent for two or more – are to be taken from the amount of benefit being paid, or from the total rent being paid on the property. One of my readers tells me that Cornwall Council has taken the latter stance, meaning a loss of £21 per week for the first spare bedroom, £29 per week for two – considerably more than the advertised average of £14 per week. Social housing provider Bromford, on the other hand, states clearly that it is a household’s housing benefit entitlement that will be cut, which seems to make it clear that it is a percentage of the benefit, not the full rent. One wonders whether the government will stir itself to provide a definitive answer before the new rules come into practice next April. I shall not be holding my breath in anticipation. Bubbling under, we have the accusation against Business Secretary Vince Cable that he slept through the new Cabinet Growth Committee’s meetings, as he seems to know nothing about them despite being, as I understand it, the vice-chair.